With the super cold weather lately, I've mostly been in maternity pants for work (especially these), but I felt like dressing up a little bit on a warm enough day last week. I picked up this colorblock dress a few weeks ago and paired it with some opaque tights and a black blazer. 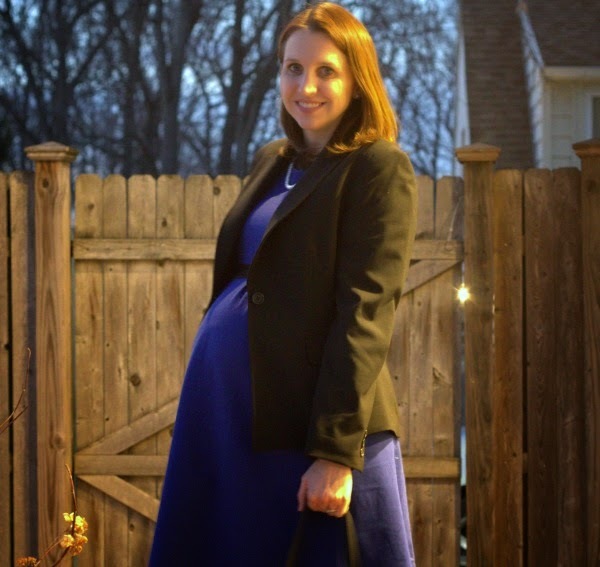 This Tahari blazer technically isn't a maternity blazer but the placement of the button works with my baby bump, plus it's roomy enough up top to be comfortable. This outfit was easy to put together - dress + blazer + simple jewelry and accessories. I felt professional and stylish! Bump Status: Currently 33.5 weeks. I'm about 32 weeks in these pictures. Linking up with Rhea Et Cetera, More Pieces of Me & On the Daily Express, Cha Cha & Pink Sole, Still Being Molly & Lipgloss & Crayons, Claire Justine OXOX, Fizz and Frosting, Get Your Pretty On, Bless Her Heart Y'all, Style Elixir, Cappuccino and Fashion, and Mama and More. I love pairing black and blue. It used to be a silly fashion no-no. I will definitely try this with one of my own blue dresses. You look great Mommy Katie! Very cute outfit! I've been wearing pants to work a lot lately too because it's been so cold, but finally today it's just warm enough to wear a dress! I'm so hoping Spring will be here soon! You look great! I love that even pregnant you take time to get dressed up & look put together!